The model’s name is Rosa, I’ve been drawing her since I began life drawing which was back in 2011. 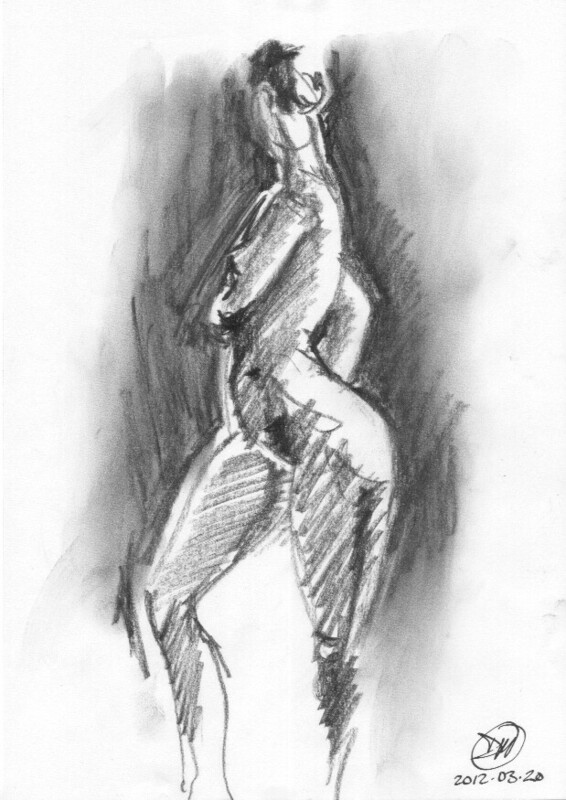 I know all her poses, her curves and every muscle on her stocky frame because I have sketched her countless times. She used to be a circus performer I have heard, she is 60 years old – she is young for her age. These days I am very focused on capturing the contour of the figures I draw, I want to improve my ability to judge distance at speed, shading is secondary but enjoyable if time permits. I regularly sketch at Basis on Folkungagatan here in Stockholm. It’s only ten minutes from my home and the 12 o’clock start on a Saturday morning is just perfect for me. The atmosphere is very relaxed and one gets a little tuition for the 100 kronor one pays which is not bad at all. 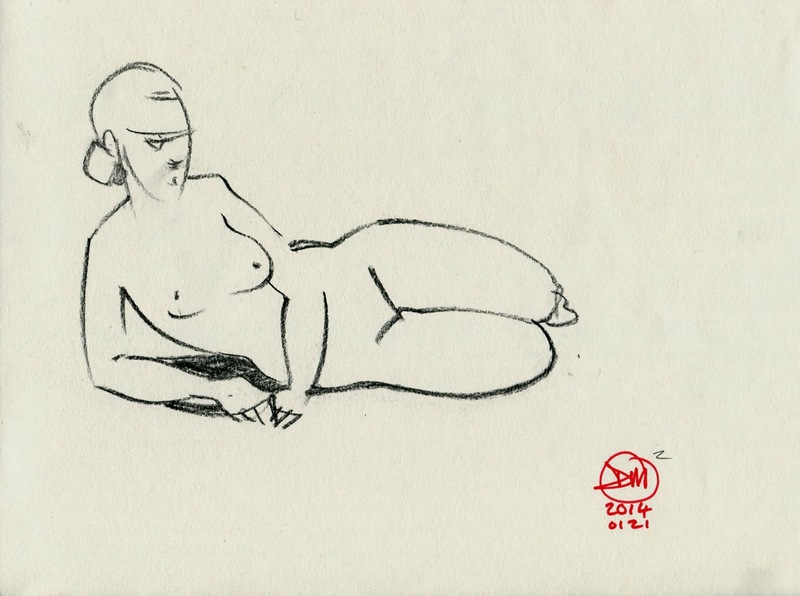 The life drawing session is two hours long. Yesterday, I went to my first Life Drawing evening since the summer break, I tried out some new techniques I had been studying, if it were a cake it would not have raised, but it was fun trying and that’s the whole point, isn’t it! 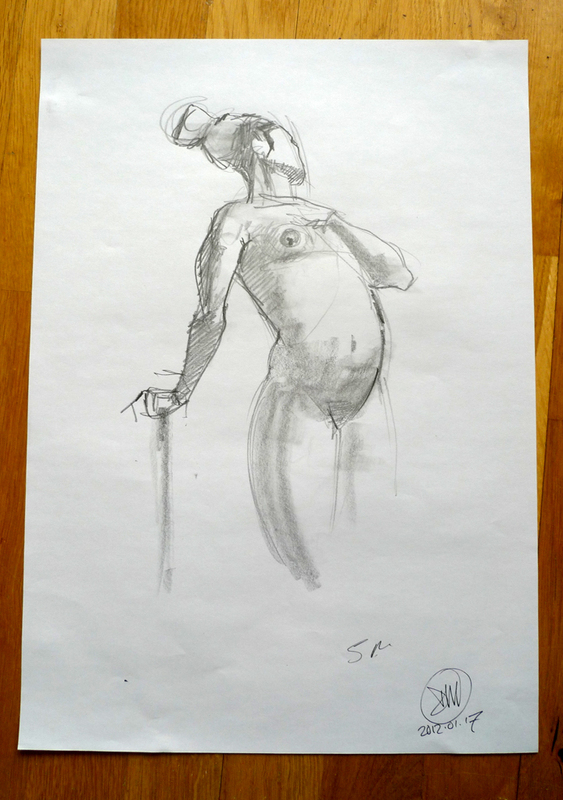 😉 Visit “My Life Drawing 2012” if you would like to see more. I completed this watercolour today but really I painted 99% of it last Thursday at my life drawing class. The pose was two hours long with a break for the model every twenty minutes. Click here to see more of my watercolours. 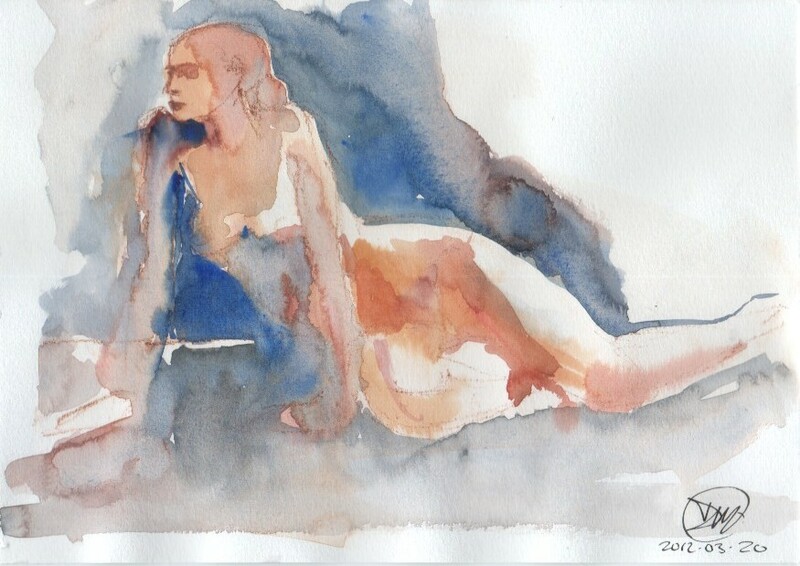 It is hard speed-sketching with watercolours – but it’s fun! Kolla mina länkar till höger under rubriken, Kroki i Stockholm, om ni undra var man kan teckna kroki här i Stockholm. 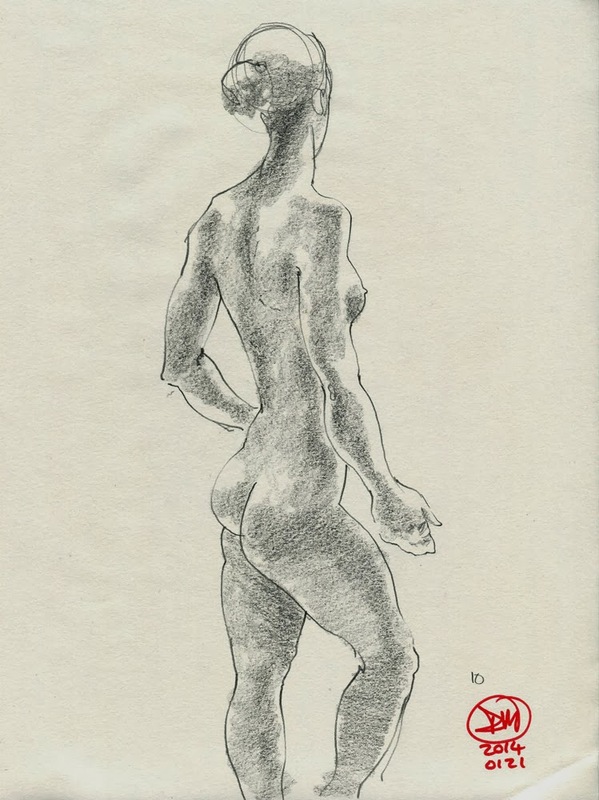 If you are wondering where to go Life Drawing here in Stockholm, check out my list of links to the right of this article under the Heading: Kroki I Stockholm (Life Drawing in Stockholm). 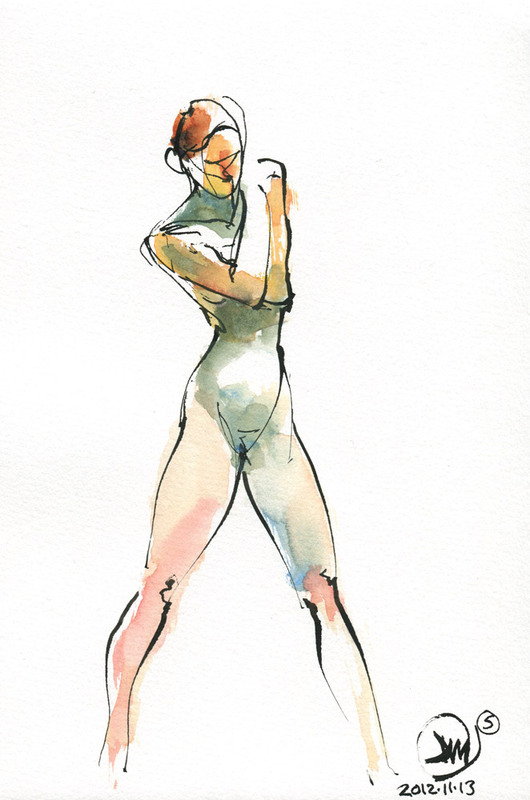 I have published a selection of my Life Drawing from 2011. Click the link here if you would like to see them.